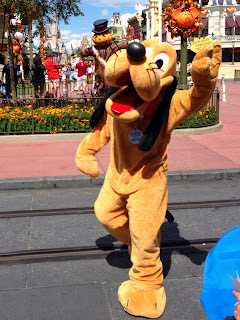 Every so often, you'll find yourself accidentally face to face with a character in a Disney park. This is when having a decent camera on your cell phone comes in very handy. Today, I found myself in that very situation. Walking thru Town Square, I noticed that Pluto was walking away from his station to take a break. I knew we were on a collision course, so my hand quickly slipped into my shorts pocket. Like a gunslinger in the Wild West, I drew my iPhone out of its "holster" and had this shot within seconds. After this close encounter, the famous dog and I continued on with our day as if nothing happened. However, it was a fun little moment that I just had to share. Last night, my family and I stayed at Pop Century as part of the Magic Band test that is currently being done. Although similar to the All-Star Resorts, this one is my favorite in the value category. The theming of the different decades is very well done. My favorite section is definitely the 80's but I'm a little bias since I "grew up" in that era. 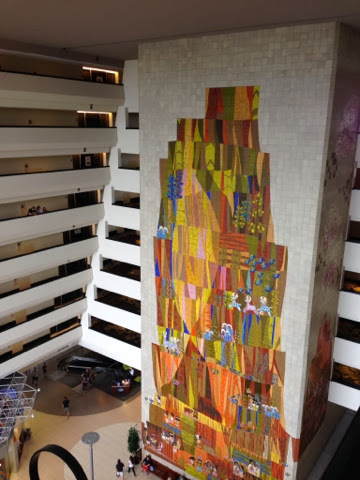 Another nice feature of this resort is that it connects to Art of Animation via a walking bridge. This give guests from each resort access to the other. This shot of the main pool area was taken from the fourth floor of the 1960's building that we stayed in. I visited The Contemporary Resort yesterday with my son. We decided to head to the roof so I could show him the great views from up there. Before heading outside, I snapped this shot from the twelfth floor. This huge mural at the center of the building is a Mary Blair piece. She is best known as the character designer for "it's a small world." 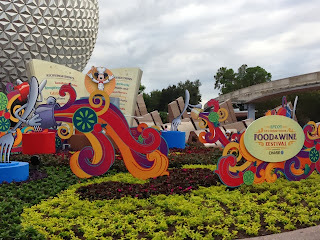 The Epcot International Food and Wine Festival opened last night, and I enjoyed attending it with family and friends. The is one of my favorite times of year at Walt Disney World, and it was fun being at Epcot on opening night. We sampled food from Argentina, Mexico, Germany, and Ireland. Everything was delicious and we are looking forward to returning many more times over the next six weeks. As my son and I were walking from the Great Ceremonial House to the Polynesian boat dock the other night, I looked up and noticed we were on the backside of the Polynesian pool water slide. 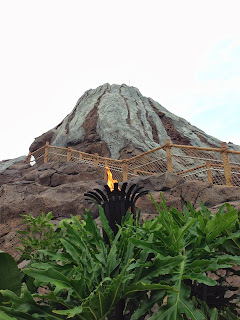 This slide is built into a volcano, which certainly fits in with the theme of the resort. 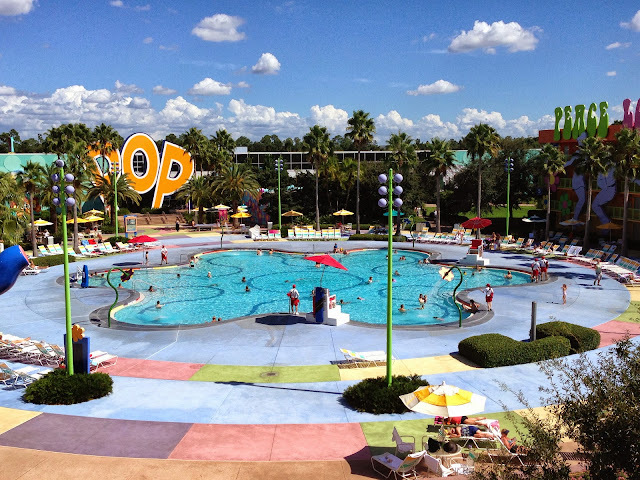 The "volcano pool" is one of the favorites among Disney resort guests. 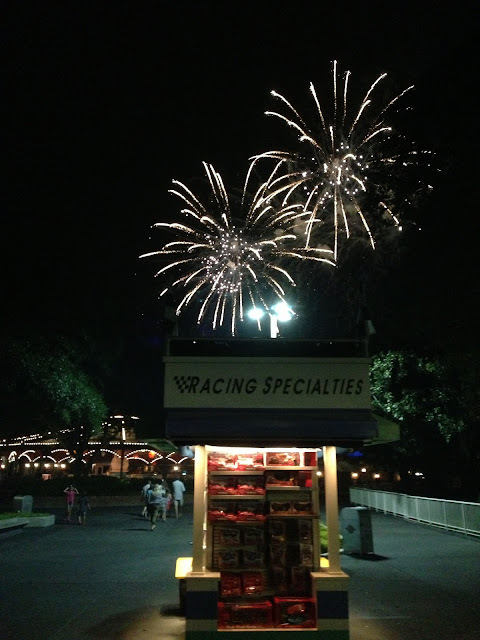 It is also very close to the Polynesian beach, which is a great spot to watch the Magic Kingdom fireworks. My son and I ran over to the Magic Kingdom for a couple hours last night. Being the huge train buff that he is, we had two attractions in mind: Walt Disney World Railroad and Big Thunder Mountain Railroad. I took this shot as we were climbing the second hill of the coaster. If you snap the picture at just the right moment, you can get both Space Mountain and Cinderella Castle in the shot. 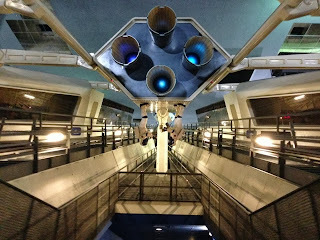 Here is an interesting perspective inside Space Mountain that is rarely seen. We knew that the attraction was down for a brief refurb this week. When we went to the Magic Kingdom a few nights ago, my seven year old son suggested we ride the PeopleMover in hopes of seeing the lights on inside of Space Mountain. Well this little future tour guide was right on the money. Needless to say, we rode the PeopleMover over and over and got many photos and even some pretty good video. This shot is of the side-by-side lift hills that climb into the mountain. It is usually far too dark to get a decent picture in this area. 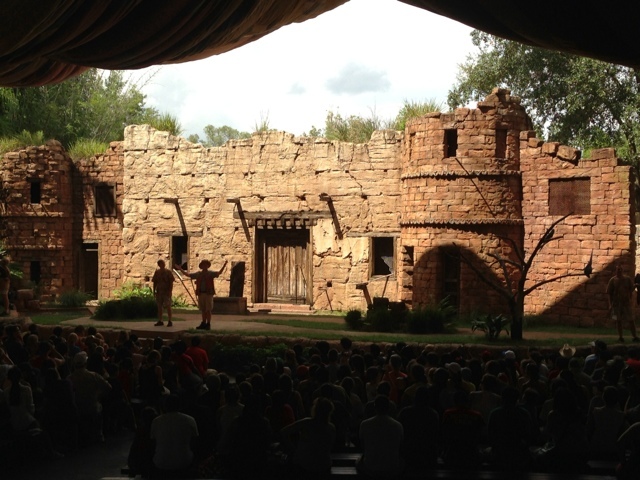 Recently, Disney announced that the Festival of the Lion King Theater at Animal Kingdom was moving from Camp Minnie Mickey to Africa. This is to make room for the new Avatar themed land that is coming to this park. It appears that construction on the theater is moving at a rapid pace. I took this shot from the bridge connecting Discovery Island and Asia. You can see large cement walls and a roof just beyond the bridge to Africa. Although Hollywood Studios may be best known for its unique thrill rides, it is also home to some of Walt Disney World's best live entertainment. 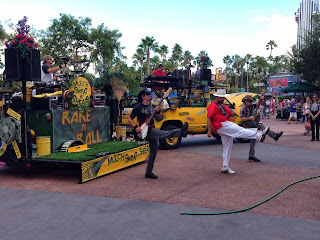 Mulch, Sweat, and Shears has been entertaining guests at this park for many years. This talented classic rock cover band, led by the charismatic Jim Doyle, can be seen several times a day in front of the Sorcerer's Hat. I took this shot a few days ago. This large lawn area sits between Imagination and The Land in Epcot's Future World. In the early 1980's, this almost became the home to a pavilion based on movies. It would have been similar to The Great Movie Ride. However, Disney felt that this "concept" could actually become an entire theme park, and the idea for this movie pavilion turned into what is now Disney's Hollywood Studios. 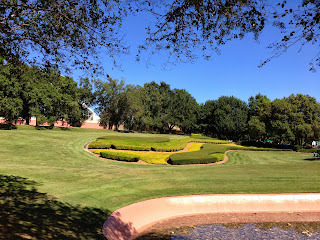 I took this shot just a few days ago while giving a tour of Epcot. When walking into the Magic Kingdom today, I noticed a large crane sitting behind Cinderella Castle. I didn't think much of it, as Disney is always building or refurbishing something. 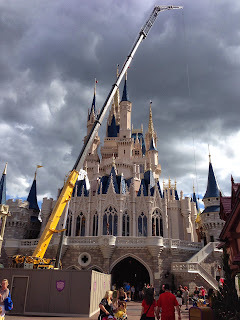 Upon closer inspection, however, I realized that they were actually hanging Christmas lights on the castle. The first "lighting" isn't until the beginning of November. Decorating this park icon for Christmas must take over a month to complete. 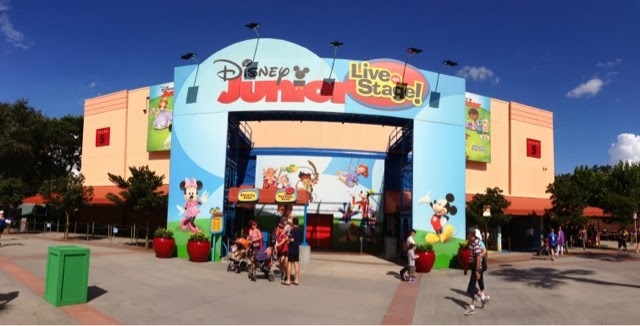 Disney Jr. - Live on Stage at Hollywood Studios is a very popular show with young kids. It has changed over the past few years and now features four current Disney Channel shows. These include Mickey Mouse Clubhouse, Jake and the Never Land Pirates, Sofia the First, and Doc McStuffins. Several of these characters host meet and greets right outside of the theater. I took this shot while my tour guests were enjoying the show. One of my favorite places at night is Main Street, USA in the Magic Kingdom. It has a whole different "feel" when all of the lights come on. The added decorations for the Halloween season are a nice touch this time of year. 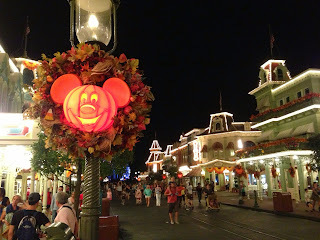 I snapped this shot just after these Mickey pumpkins were added to the lamp posts a few weeks back. As a tour guide, I am always trying to get fun "on-ride" photos of my guests. 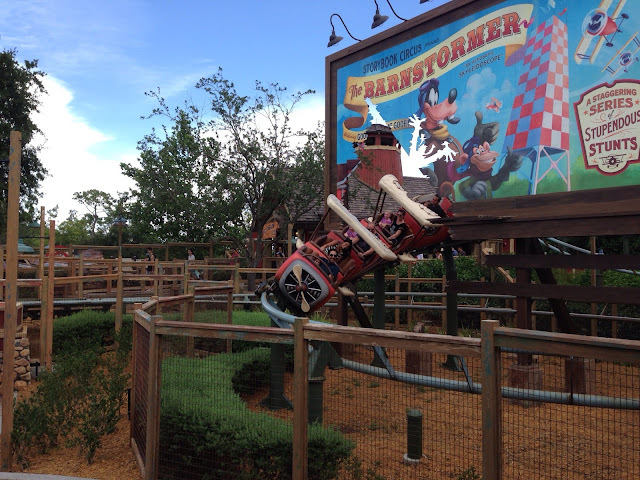 The Barnstormer is one of those attractions that allows me to do this. However, I have to be paying close attention to where they are sitting in the coaster to be able to snap the picture at precisely the right time. It is exciting when one of these shots turns out well. The Festival of the Lion King show at Animal Kingdom is one of the best in all of Walt Disney World. The music is fantastic, and the singers, dancers, and acrobats are very talented. There are also gigantic animal "characters" stationed in the four corners of the theater. 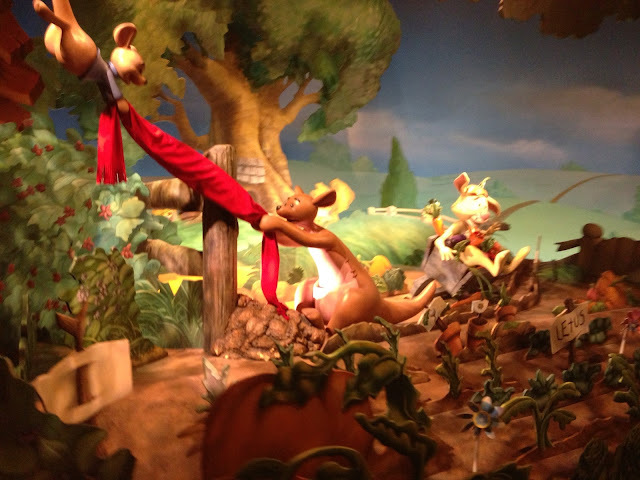 Disney makes these animals seem lifelike as they gently move throughout the show. I took this shot of Simba while enjoying a performance a few weeks ago with my sister and her family. Peter Pan's Flight is a favorite for so many Walt Disney World fans. It is a classic attraction in every way. 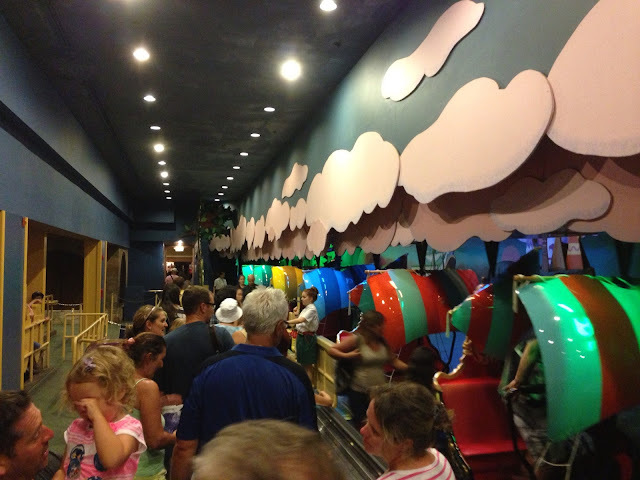 Even though the ride only lasts for 2 minutes and 45 seconds, guests routinely wait over an hour to fly off to Neverland. I snapped this shot while in the queue a few weeks ago. There are three major "live" shows at Animal Kingdom. 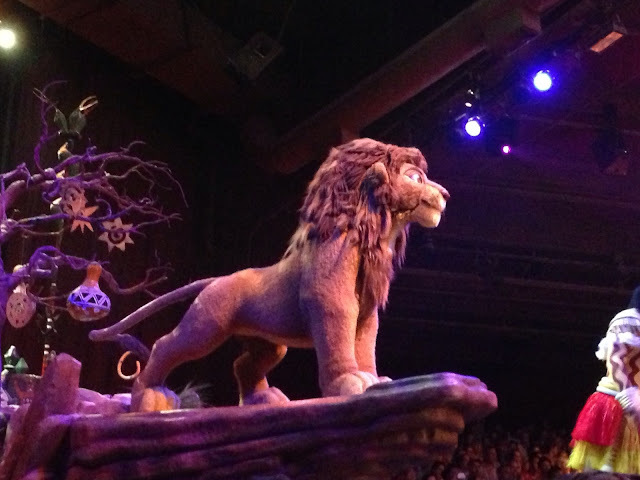 The Broadway style Nemo and Lion King shows are among the most popular in all of Walt Disney World. However, Flights of Wonder should not be overlooked. It features many live birds with various talents that are used to educate and entertain guests throughout the day. I snapped this shot while enjoying the show a few weeks ago. Of the four "moderate" class resorts at Walt Disney World, Port Orleans - French Quarter is considered the best by many in the Disney fan community. It is the smallest of the group, which makes for easy access to the lobby, pool, and bus stop. It is very well themed and conveniently located near Epcot. I took this shot a few weeks ago while visiting my sister and her family, who were staying in this building. 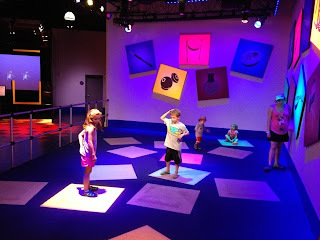 The "post show" area of Journey Into Imagination at Epcot is called ImageWorks. 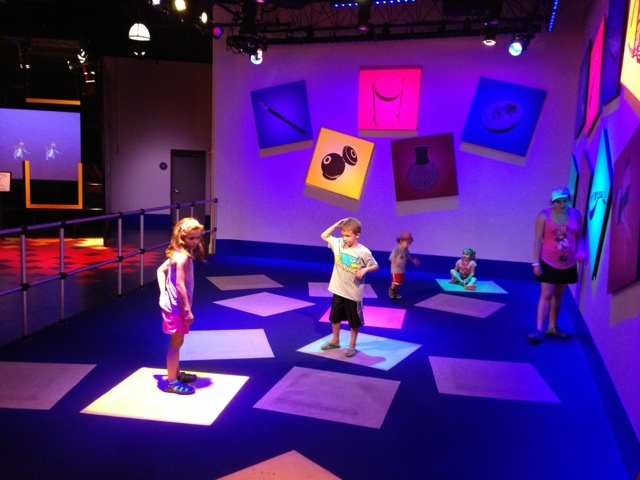 This section is referred to as Stepping Tones, where guests stand on squares that activate instrument sounds. If you walk out of ImageWorks and turn right, you will find the Magic Eye Theater. Exactly 27 years ago, today, Captain EO opened in this spot. Although this Michael Jackson 3D film left in 1994, it returned in 2010 and still entertains guests today. One of my favorite movies is Toy Story, and it is always fun to see Buzz and Woody around the Disney parks. 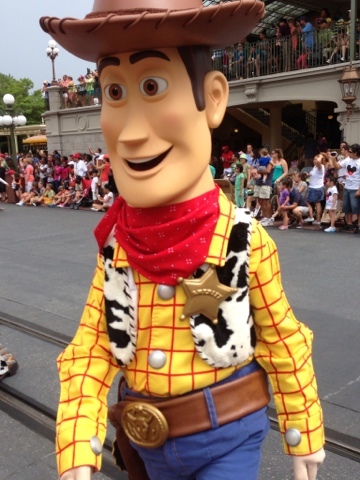 Woody can normally be found in the Frontierland section of the Magic Kingdom and over in Pixar Place in Hollywood Studios. However, I took this shot during the afternoon parade at the Magic Kingdom a few weeks ago. Today is our son's 7th birthday. In his honor, I thought I'd post this shot of him enjoying one of his favorite attractions a few days ago. This picture came from the finale of the ride where guests choose their own future. You can tell from his expression that he enjoys Spaceship Earth! 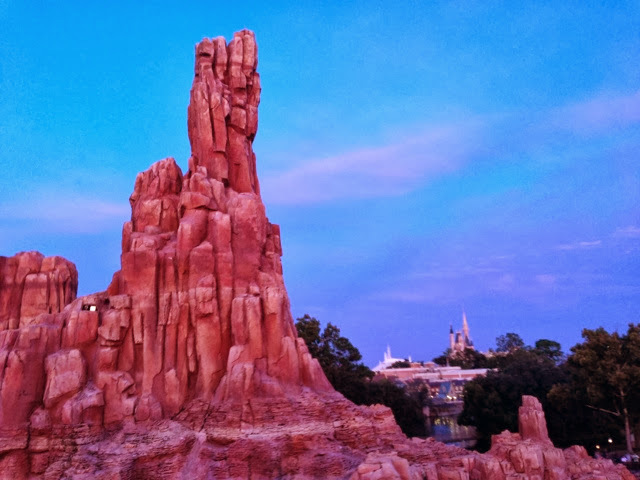 There are so many great recreational activities that most Disney resort guests don't even know exist. There are the big ones like golf and swimming, but there are several less obvious activities that often get overlooked. 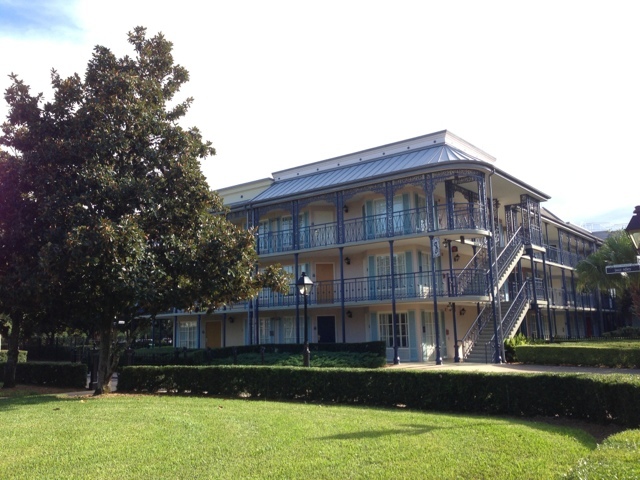 One of the best resorts to find these "extras" is Port Orleans - Riverside. I decided to start off my son's birthday week with a Kayak adventure at this resort. This was a very inexpensive and fun excursion on the Sassagoula River. Today is the 15th anniversary of the day that Mr. Toad's Wild Ride permanently closed at the Magic Kingdom. Despite the protests of many loyal Toad fans, this opening day attraction closed its doors permanently on September 8th, 1998. However, less than a year later, The Many Adventures of Winnie the Pooh opened in that location. Pooh is Disney's 2nd best selling character of all time, so it made sense to create an attraction based on him. I snapped this shot while riding in a "honeypot" a few days ago. The Fountain View Ice Cream Parlor at Epcot has officially completed its transformation into the second Walt Disney World Starbucks. We had the chance to visit this "new" location tonight. The ice coffee was delicious (as expected), and the decor fit into the theme of Future World. The Main Street Bakery Starbucks in the Magic Kingdom is certainly more "decorated" to tell a story and fit in with the Main Street, USA theme. However, the controversy about bringing Starbucks to this iconic spot in the Magic Kingdom was not an issue in the Epcot version. Epcot simply lost an ice cream parlor in favor of a coffee shop. If you look closely in this shot, you'll see my wife and son posing to the right of the entrance doors. Here is another shot from our visit to Coronado Springs Resort from a few weeks ago. This is the "Ranchos" section of the resort, which has a very desert southwest feel. Although this area is quite a distance from the front of the resort, it has its own bus stop and is only a short walk to the main pool. This is one of those resorts that uses its theming to transport you to a different area of the country. Wishes started while we were riding The Barnstormer last night. As we made our way from Storybook Circus to Tomorrowland, I got many unique shots of the fireworks from different angles. I took this photo just before we got in line for Tomorrowland Speedway. You can see a toy kiosk in the center and The Mad Tea Party in the background. After a fun night at the Magic Kingdom with my family, we found ourselves walking through Adventureland around park closing time. 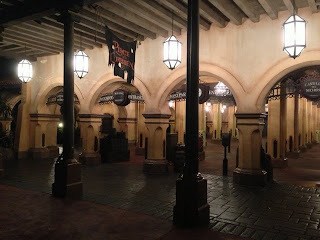 For a short time, there were no other people in sight, including guests and cast members. It is quite a different scene from the hundreds of people found here on a typical afternoon. I snapped this shot of the Pirates' entrance just before a cast member came around the corner. For about 30 seconds, Adventureland belonged to us! 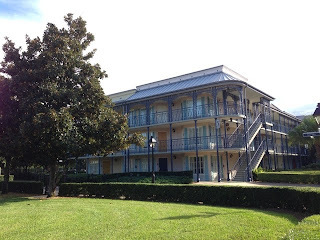 My son and I decided to take a stroll around the Port Orleans - Riverside Resort tonight. 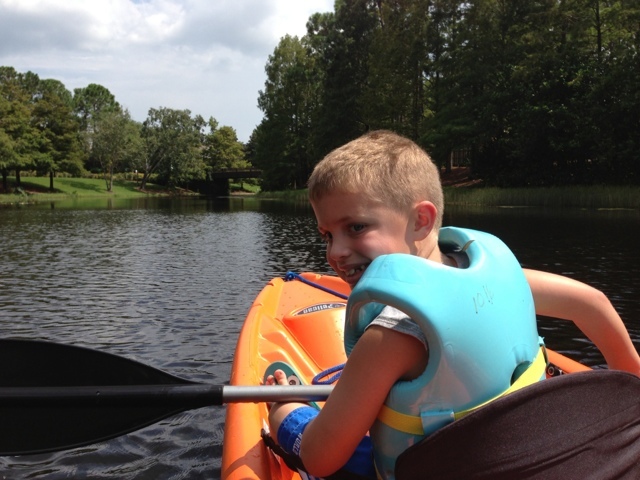 He has recently decided that he'd like to try fishing, so we wanted to check out what this location had to offer. This is a very large resort with many recreational opportunities, including biking, kayaking and fishing. I was able to get this shot of a horse drawn carriage crossing in front of a building in the Magnolia Bend section of the resort. As I'm sure I've mentioned in previous posts, this place is special to my wife and I, as it was where we stayed on our honeymoon. 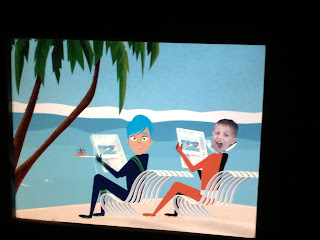 My son and I saw an interesting sight when visiting The Seas with Nemo & Friends at Epcot last week. 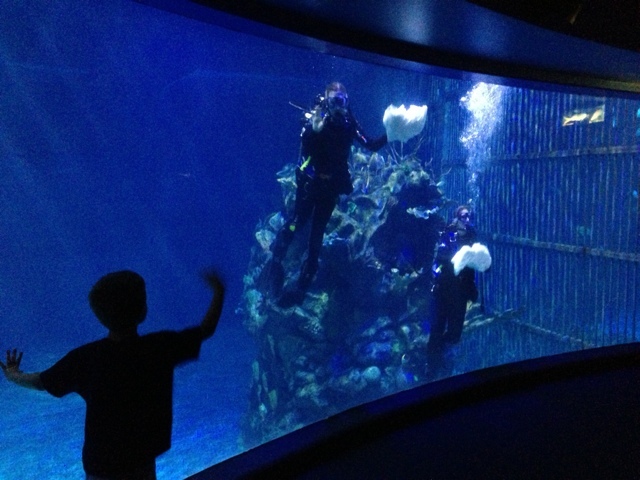 There were several divers in the tank cleaning the inside of the glass. They appeared to be using the same towels found at the Disney resort pools. They were very friendly and even stopped for a moment to pose for a picture with my son. You truly never know what interesting things you may see when visiting a Disney park. Anyone visiting the Magic Kingdom since the beginning of last week has seen that it is now decorated for Halloween. I was there with my family on Tuesday, when I took this shot just outside of the right entrance tunnel under the Main Street Train Station. It is amazing that they have put up the decorations more than two months before Halloween. 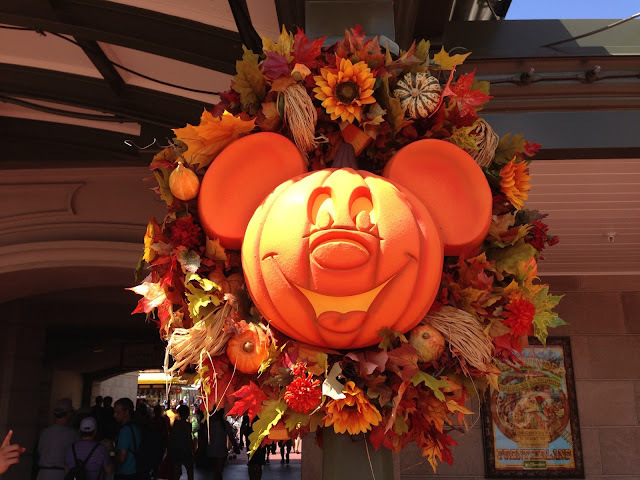 However, the first "Mickey's Not So Scary Halloween Party" is on September 10th, so it makes sense for them to decorate a few weeks ahead of time.